At Camp Chef we’re all about good food, good times, and fun with friends and family. The SmokePro Pellet Grill Lineup will make this summer one to remember and that brings me to my next point. There is one thing in this world that can unite people faster than anything else no matter their differences and it’s the one thing that led me to Camp Chef. I love good food, but most of all I love good barbecue, and with summertime knocking on my front door I’m ready to get out and get cooking. We are just wrapping up National BBQ Month, but I’m craving for more so without further ado, here’s to our backyard barbecues! Don’t slave over the food! I love food, but it’s really about the gathering of friends and loved ones that makes a good meal so special. That being said, I never want to become a slave to the kitchen; I did that at the pizzeria when I was fifteen when I spent countless hours working dough, topping pizzas and cleaning ovens. My mother-in-law put it best when she said “this hospitality thing was never easy.” I want to enjoy my cooking experience and now I can. The SmokePro DLX pellet grill has empowered me to create great food without becoming slave to my kitchen. For me, slow smoked barbecue has seemed challenging but now it has gone from a daunting task to a challenge worth accepting. 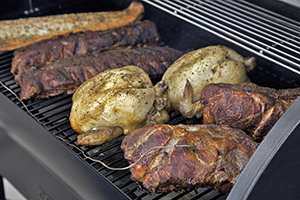 The introduction of propane smokers, electric smokers, and wood fired pellet grills have made things simple and easy to grill out. 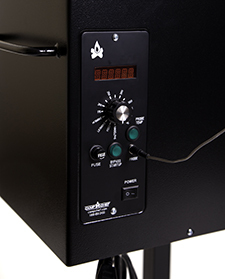 In the case of my SmokePro pellet grill, it’s a simple set it and forget it. The temperature is digitally monitored and controlled keeping things steady so I don’t have to miss the game or any causal conversation. Last week I smoked a beef brisket and made some amazing brisket burgers (check out the brisket recipe here). 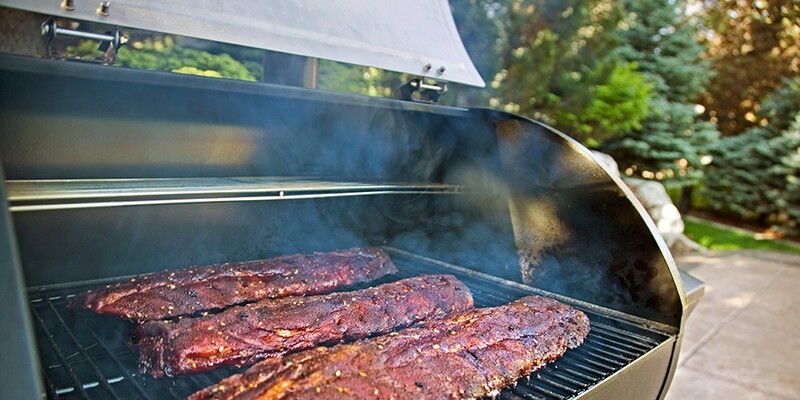 The temperature was set to hi smoke (225°F) and the pellet grill automatically maintained that temperature overnight. Even when outside temperatures dropped to almost freezing, the temperature remained consistent. A continuous fan and auger system maintain a consistent burn of pellets while creating a convection style of cooking. This means I can bake too. All at the flip of the switch. Literally. Grills in general are difficult to clean. But like anything it needs to be maintained to gain peak performance. My car, my lawn, hell; my own body needs maintenance. And so does your pellet grill. Anything that burns wood creates ash, with a pellet grill, that ash needs to be removed in order to maintain a consistent burn. This is where Camp Chef’s SmokePro’s exclusive ash kicking feature comes into play. The patent pending ash clean-out design simply removes the debris by the pull of a lever. In the meantime my neighbor is pulling out greasy pellet grill parts to vacuum ash from his burn cup, which is a big ash deal. The biggest reason I love the SmokePro DLX pellet grill is the difference I can taste. Camp Chef offers several SmokePro hardwood flavors including Apple, Hickory, and a pretty tasty Natural Herb Blend. But my favorite is the Competition Blend. 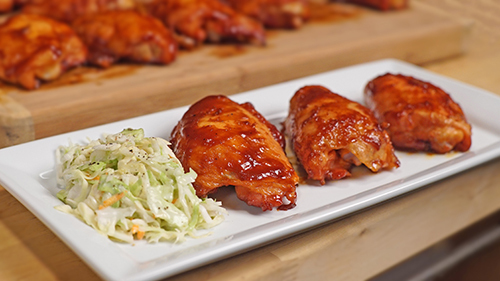 It adds just the right amount wood fired flavor to your meat, veggies or baked goods. Time after time the flavor has been richer and the food has been juicier than anything I have tried on a standard grill. 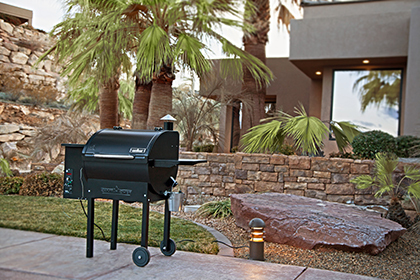 Check out Camp Chef’s line of SmokePro pellet grills or check out the latest recipes and try them for yourself.